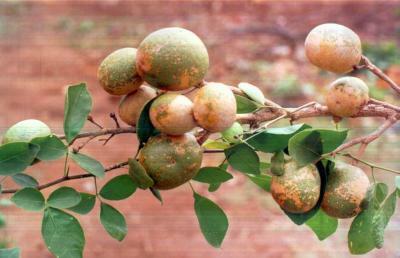 Wild Himalayan bael is an inferior type of bael that grows in the sub mountainous Himalayan region. It is more or less similar to the regular cultivated bael which is basically a fruit of tropical region, except that the fruirs are small, rind is very hard and the tree is also relatively smaller. 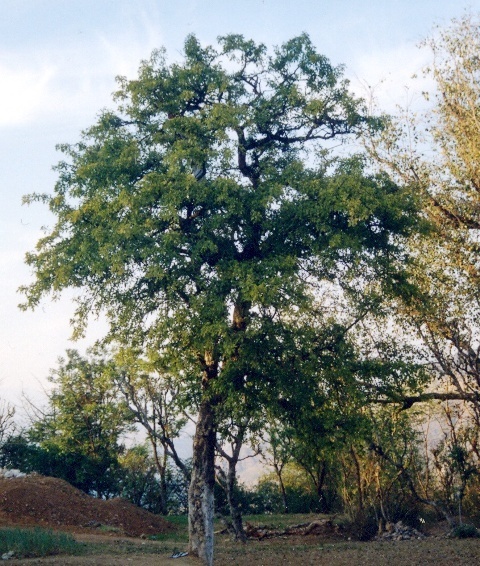 Wild Himalayan bael is a sacred tree, dedicated to Lord Shiva. The offering of bael leaves is a compulsory ritual of the worship of Lord Shiva in the hills. This importance seems largely due to its medicinal properties. All parts of this tree, viz., root, leaf, trunk, fruit and seed, are used for curing one human ailment or another. It grows wild throughout the low hills of Himachal Pradesh, ascending up to 1,000 metres. The fruits of the wild trees are, however, considerably smaller than those of the cultivated types cultivated in the plains. 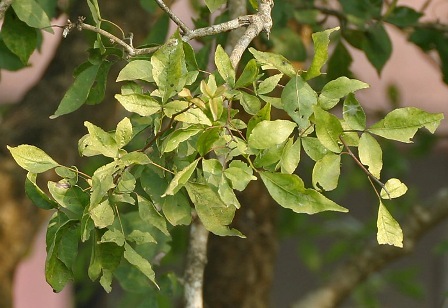 A small to medium-sized aromatic tree, deciduous; stem and branches, light brown to green; strong axillary spines present on the branches; the average height of tree, 8.5 metres. Leaves, alternate, pale green, trifoliate; terminal leaflet, 5.7 cm long, 2.8 cm broad, having a long petiole; the two lateral leaflets, almost sessile, 4.1 cm long, 2.2 cm wide, ovate to lanceolate having reticulate pinnate venation; petiole, 3.2 cm long. Flowers, greenish white, sweetly scented, bisexual, actinomorpbic, ebracteate. hypogynous, stalked; stalk, 8 mm long; diameter of a fully open flower, 1.8 cal; flowers, borne in lateral panicles of about 10 flowers, arising from the leaf axil; calyx, gamosepalous, five-lobed, pubescent, light green, very small in comparison with petals; corolla polypetalous, with 5 petals, imbricate, leathery, pale yellow from above and green from beneath, length 4 mm; androecium, polyandrous, numerous, basifixed, 4 mm long, dehiscing longitudinally; gynoecium, light green, 7 mm long, having capitate stigma and terminal style. Fruits, yellowish green, with small dots on the outer surface, oblong to globose, 5.3 cm to 7 2 cm in diameter; weight, 77.2 g; volume, 73.7 ml; pulp, yellow and mucilaginous, the pulp of dried fruits retains its yellow, and also remains intact; rind woody, 4 to 5 mm thick. Seeds, numerous, embedded in the pulp, oblong, compressed, white, having cotton-like hairs on their outer surface. The flowering was observed to have taken place in Koti area (12 km from Kalka towards Simla) from the second fortnight of June to the first fortnight of July. The fruits take almost one year to mature. The peak fruiting season is during May and June. Observations on the trees at Koti revealed that the average yield of a wild bael tree was 62.5 kg, which is quite good. This fruit is a very good source of protein which is 5.12 per cent of the edible portion. The total mineral content of the edible portion, as represented by ash, is 2.663 per cent. The percentage content of some of the minerals, viz. phosphorus, potassium, calcium, magnesium and iron is 0.137, 0.746, 0.188, 0.127 and 0.007 respectively. Watt (1889) reported the unripe dried fruit to be astringent, digestive and stomachic. According to him, they are prescribed to cure diarrhea and dysentery. The ripe fruit is a good and simple cure for dyspepsia. The roots, and the bark of the tree are used in the treatment of fever by making a decoction of them. The leaves are made into a poultice and used in the treatments of ophthalmia. According to Dastur (1962), the rind of the ripe fruit is also sometimes used as a medicine. The roots are sweet, cure the fevers caused by tridosha, stop pain in the abdomen, the palpitation of the heart, and allay urinary troubles. They are also useful in the disordes of vata, pitta and kapha (Kirtikar and Basu, 1935). 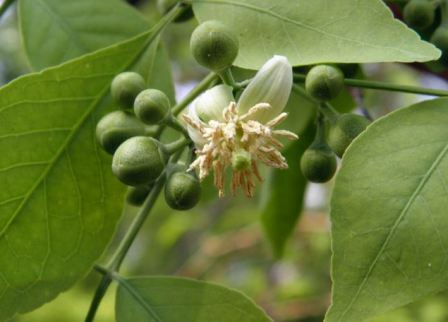 The fruits are very useful in chronic diarrhea and dysentery, particularly in the case of patients having diarrhea, alternating with the spells of constipation. Sweet drink (sherbet) prepared from the pulp of fruits produce a soothing effect on the patients who have just recovered from bacillary dysentery. The unripe and half-ripe fruits improve appetite and digestion (Jain, 1968; Jauhari, 1969). According to Dixit and Dutt (1932), the fruits of Aegle marmelos Correa contain a furocoumarin marmalosin, which is responsible for its medicinal properties. The bark contains umbelliferone and other coumarins. The pulp of the fruit is sweet and is highly aromatic. The overall eating quality is fair. The fruits are usually eaten by people. They are also used in the preparation of many medicines in the villages. These protein-rich fruits are also used in making a very good drink. They also can make a good jam. The utilization of the fruits to make jam should be tried at commercial scale. The wood of the bael-tree takes a fine polish and is used in building houses, constructing carts, agricultural implements, in oil-mills and sugar-mills, in making pestles, handles of tools, in making combs, etc., and for carving but the tree is too valuable to be felled for its timber. A yellow dye is obtained from the rind of the unripe fruits and is used in calico-printing. An essential oil is distilled from the rind (Dastur, 1964). The dried fruits, after their pulp separated from the rind, are used as pill-boxes for keeping valuable medicines, sacred ashes and snuff. The leaves contain 0.6 per cent essential oil, mostly composed of d-limonene. Considering all these properties of this wild fruit-tree, there should be a large scope for exploiting it for commercial cultivation in the hills.